Council has released the proposed structure plan for Virginia Estate. The above map indicates the (indicative/preferred) height limits for the various precincts. There is much in this set of documents that require comment. However, due to the paucity of detail, we can only surmise what will eventuate. One thing however is abundantly clear – once this structure plan and its accompanying Comprehensive Development Plan is passed by council, sent off to a Planning Panel, and it enters the Planning Scheme via its associated Amendment then community involvement and input will NOT EXIST. There will not be any objector review rights in exactly the same way that occurred with the Caulfield Village projects. Council is not even bound, according to the Schedule for this Comprehensive Development zone, to notify any resident. Hence, there are no guarantees that what is presented in these documents will be the final outcome. Below we feature some points from the various documents which reveal the ‘wriggle room’ allowed to the developer. Building heights are NOT MANDATORY! They are ‘preferred maximum heights’. ‘SHOULD’ instead of ‘MUST’ dominates throughout all of the built form specifications. And we all know what ‘should’ means!!!!!! For all the talk about rehashing the Open Space Strategy and considering overshadowing at the winter solstice, we still get the following – – Development must not cast any shadow on more than 75% of the area of any public open space described in Plan 2 of the incorporated CDP between 11am and 2pm on 21 June the winter solstice. What is totally and deliberately misleading is the following breakdown of residential versus commercial/retail components of the site. 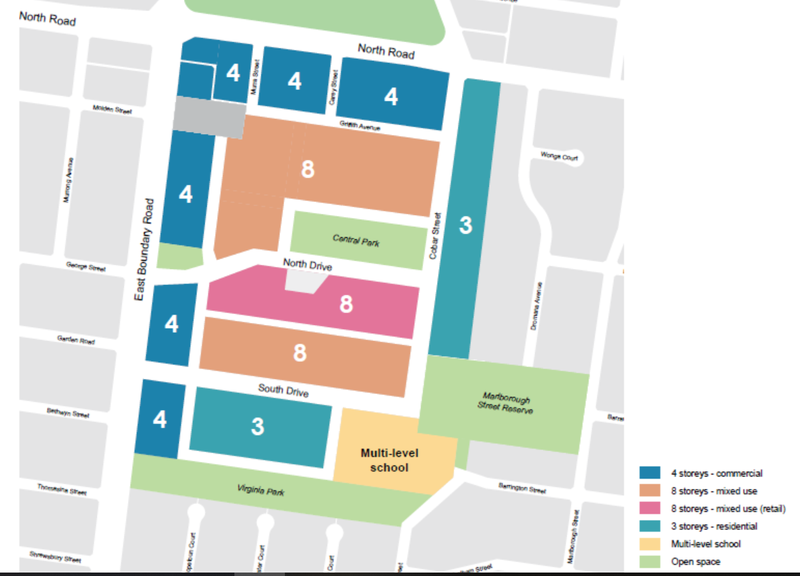 The only areas specified as NON residential are the buildings to go along North Road, and East Boundary Road. All the rest will have residential dwellings built above the shops/offices located on the ground or several floors above. To therefore claim that only 4.92 hectares of the entire site is set aside for ‘residential’ is inaccurate and unacceptable. An application for the use of land is exempt from the notice requirements of Section 52(1)(a), (b) and (d), the decision requirements of Section 64(1), (2) and (3) and the review rights of Section 82(1) of the Act if it is generally consistent with the incorporated CDP. An assessment of the likely traffic impacts associated with the proposed development, including the ability of the Cobar Street / North Road / Crosbie Road to function effectively without signalisation. This is to include an assessment of the precinct’s existing and the proposed development traffic generation during peak AM and PM period. Where the traffic generation is expected to exceed 2,000 vehicles accessing the site in the PM peak, the Cobar Street site access intersection should be implemented. What this means is that the developer does not have to do anything UNTIL they determine that Cobar Street has 2000 cars travelling along it each day. Thus first get the permit, build and then worry about traffic and safety! According to the figures provided in this document we are supposed to accept that the developer will fork out $60 million in infrastructure improvements to the site of which $16m will be for community improvements. What we query is given the flooding and drainage issues, plus contamination, that $1,199,835 comes anywhere near what the cost will be to ameliorate the potential for flooding and ensure contamination is eliminated. On the positive side, council will get a ‘community hub’, a sports pavilion, and some open space. These will only come into operation however when ‘population growth is deemed to require the infrastructure’. So once again it is build first and then worry about the necessary infrastructure after the fact. Even more concerning is the community infrastructure levy assigned to each dwelling of $831.65. Legislation allows a maximum of $1,150. Thus Gillon is getting a discount of $318.35 per dwelling. In total that amounts to just under a million dollars. Other councils have successfully exacted this full cost for major developments. Not so in Glen Eira! No indication is provided as to how traffic and parking will be handled. Will we have subterranean car parks 3 levels down in a flooding area? Or will we have high rise car parks? Why is current traffic analysis focusing almost exclusively on PM peak periods? If the proposed school is next door to 3 storey building then how high will this school be? – 3 storeys, 4 storeys, 5 storeys? And will the 1.2 hectares be sufficient to provide open space for up to 1150 students – or will they be expected to utilise fully existing open space next door? The Section 173 agreement between developers and council will remain ‘secret’ according to the officer report recommendation – ie Direct officers to not commence exhibition unless the appropriate Section 173 Agreements are signed and executed by all parties and a summary of the purpose of the document is exhibited along with the planning controls. In other words, residents will not get to see the nitty gritty of this agreement we presume! Past experience has demonstrated that the more restrictions placed by Council, the more difficult it is to make a project feasible. However, it is understood that this is an ambitious outcome to achieve, with many factors that are outside the landowners’ control. It is important that the agreement is written in a way that gives the landowners flexibility and the greatest chance to achieve this outcome. As such it is recommended that the agreement is primarily focused on this outcome, with appropriate detailing of the mechanism only where required. Finally, the VPA has today released another 10 updated ‘background’ documents from its 2017 versions. We will comment on these once we have had time to digest them fully. In total these documents amount to well over a 1000 pages. Yet councillors are expected to vote on these matters next Tuesday night. How many of them we wonder will have read even some of the documentation? What questions, if any, will this documentation bring to the fore from councillors? The traffic “hell” solution is Hope!!!?? This is a one to one quote from the plan. respond to and resolve the need to signalise the Cobar Street intersection in the future. – The Cobar Street infrastructure is not required until several years’ time. traffic outcome for the full development of the site. Haha tooo Naive to think that residents on east boundery will let this plan go before solving the traffic issues. Watch out the plan is based on Hope…. location and capacity to service the anticipated car parking demand. Where it is 4.92 Ha. Corrected. However the argument still holds. There is far more than 4.92 hectares or 20% of the land which will have apartments built. We estimate that the 8 storey preferred heights cover at least 60-70% of the entire site. These are percentage figures for site coverage could have been provided in the plan along with percentage figures for car parking above ground and subterranean, permeability percentages for site coverage would have been handy. I get the feeling what on paper and that’s what the councillors will vote on next Tuesday, is not what we are going to get. The chance to get private rooftop gardens on each residential building for the village residents ( can I say Village People ) ie. more open space with more greenery is a totally wasted opportunity on every level of sustainability, this would provide leisure activities, jobs, sales of materials recycling of compost etc. I couldn’t find any mention of pollution clean up controls, would his be applicable to include in a structure plan? If all the heights are preferred instead of mandatory then there’s nothing to stop them from putting in applications for ten or more storeys if they feel like it or reckon that is more profitable. My understanding of the way the open space levy should work is that any development of more than two apartments pays 5.7% at subdivision time. Council can accept this as cash or land. If I’m right then what they are proposing for this site is contrary to this. All the statements are about nda and not the total size of 24 hectares. This approach differs from every other site and in my opinion is selling the community short. If a mere 5.7% was imposed on the entire site then that would mean more already than what the developer is offering. For 3000 apartments then it should be at least 10% of the entire site which makes it an open space of at least 2.4 hectares. Using nda is another way of fudging the figures I would say. Who what a synthetic soccer pitch on or next to this important development, this will be a stinking hot piece of pollution right next to thousands on homes and the proposed school, The question is will this synthetic areas be fenced and the general public excluded from their public open space and will it be only used by a selected few with the keys to the gate. Where did you get this from? Can’t find any announcement.